Pyrolytic caurbon haes ane o the lairgest diamagnetic constants o ony ruim temperatur material. Here a pyrolytic carbon sheet is levitatit bi its repulsion frae the strang magnetic field o neodymium magnets. 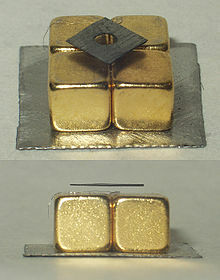 Diamagnetic materials are repelled bi a magnetic field; an applee'd magnetic field creauts an induced magnetic field in them in the opposite direction, causin a repulsive force. In contrast, paramagnetic an ferromagnetic materials are attractit bi a magnetic field. This page wis last eeditit on 10 Julie 2018, at 05:55.